Tareq sat down next to Mhumhi, one small hand still clinging painfully to the loose skin between Mhumhi’s foreleg and ribcage. He used his other fist to rub his eyes. Mhumhi himself tolerated it, mostly because he was unsure what to do or say at the moment, looking at the tense stalemate that had occurred between Kutta and Mini. Or at least from Kutta’s end. He could feel the anxiety coming off his sister in waves. Mini was harder to read, as usual, her eyes bulging inscrutably. Vimbo gave a soft grunt and pushed himself past Kutta, maging her stagger sideways a bit. He circled over to Mini and picked her up by her rump, half-dragging her to the darkened corner, where he lay down and set her between his forelegs. Mini did nothing but blink rapidly. “Vimbo,” said Kutta, with a trace of irritation in her voice. The hyena pulled his lips back a moment, then laid his head next to Mini. “We’d better tell him what’s happening, too,” Mhumhi said, waving his tail. “He might want to…” He trailed off. He really had no idea what Vimbo might want to do. He could still smell the faint but unpleasant scent of singed fur coming off of his body. Mini struggled to raise her chest and put one small black paw over Vimbo’s muzzle, where it had quite a bit of free space. Kutta shot him a look. Mini licked her lips and made a snuffling sound. “Let me ask Vimbo,” she said, and then turned and spoke to him at length in hulker. While they conferred, Mhumhi felt Tareq tugging at his loose skin. Tareq merely wrinkled his face in together and put his thumb in his mouth. “We haven’t told him anything,” Kutta pointed out, stepping closer to them. She licked Tareq’s wrinkling forehead and he jerked away. “All right, Tareq,” said Kutta, wagging her tail, and swallowed. Vimbo gave a grunting giggle. They looked over at him and Mini again. “I’ve told him what you told me,” she said. “Though…” She gave a little wheezing sigh. She turned and made a feeble attempt to lick at the burnt spot above Vimbo’s top lip. “He had an,” began Mhumhi, then paused, unsure if “accident” was really the right way to put it. Vimbo rolled his black eyes to look towards him. Mhumhi’s bruised shoulder gave a little twinge. Mini gave a little yip, raising her head up as high as it would go. “Well, what did he say? What was it?” Mini was squirming, trying to pull herself up, pushing against Vimbo’s muzzle. Vimbo rolled his head back the other way and gave a little whine. “I don’t want to be what?” Kutta asked. “I don’t know,” said Mhumhi. Mhumhi felt compelled to look down at his forepaws. Kutta gave a little snort. Mhumhi thought of O and the little plastic ring. Mini hesitated, now slumped over Vimbo’s muzzle. Vimbo was blinking at her. “He shouldn’t become a man!” snapped Mini. “Mini-” began Mhumhi, but she showed her teeth and gave a shrill growl. Vimbo grunted and pulled his muzzle back, leaving her on the ground. Even Mhumhi thought that this was a bit callous, and looked reproachfully at his sister, but Mini showed little reaction to it. Mini looked up at him from her draggled position on the floor. “But he has a bit more,” she said. “It’s not right,” said Kutta, but in a muted way, looking at Mhumhi. He could offer her little support. If Mini would not tell Vimbo, there was little they could do to change the matter. “Why’s he a man?” asked Tareq, rubbing his eyes again. A sharp light seemed to form in Kutta’s eyes. Mini said something sharply in hulker. Tareq hesitated in his rubbing. His face wrinkled again. “What did you say to him?” said Mhumhi, stepping closer to Tareq, feeling himself stiffen. That was Kutta, stepping close on the other side of Tareq. “I deserve it,” said Mini. Mhumhi gave a shrill twitter. “I don’t-” began Mhumhi again, but his sister nudged him with her shoulder, urgency now in her eyes. Mhumhi squeezed his jaws shut, quivering with suppressed speech. Kutta was nudging Tareq back up on his feet. Vimbo rose as well, nosing at Mini on the ground. She said a few words to him in hulker. Tareq put his head on Mhumhi’s shoulder and made a sleepy noise. Vimbo gave a little giggle, then lowered his rump as if he were going to sit next to Mini again. Mini turned her head and uttered a sharp yap. “Looks like he wants to stay,” said Kutta, and now it was Mhumhi’s turn to nudge his sister. Mini said some more words to Vimbo in hulker, angling herself away from him and growling. Vimbo stared at her, his nose hovering just inches from her small head, and then opened his jaws and put his mouth around it. “Vimbo!” cried Kutta, and Mhumhi sprang forward with a growl. Vimbo lifted Mini up by her head, her forelegs swimming feebly. Vimbo gave his head a small jerk, adjusting his grip closer to the neck as Mini struggled, then turned and gave Mhumhi a wide-eyed look with her still dangling. Mhumhi had moved very close, entire form bristling, letting loose real snarls. “Put her down!” he spat. “Put her down!” snarled Mhumhi, who had been seized with a strange and terrible fear- for a moment he could not place it- but yes, of course, it was the sight of a hyena, carrying a small dog by the head. Vimbo gave a little squeal and retreated back to the corner, still clinging to Mini. “It hurts,” whined Mini. “Stop that.” She added some words in hulker. Vimbo made a garbled sound around her. There was a shrill beeping sound, and they all jumped. Vimbo dropped Mini, who squealed as she hit the ground. A light above the door to the dark room was flashing. Mhumhi sensed the whirring and rumbling of some great machinery beneath his paws. Mhumhi’s gut was still churning, but his sister was right, they were out of time. He took Tareq’s hand gently in his jaws and tugged him forward. Vimbo gave a sharp grunt and bent to pick up Mini again, this time by her rump, even as she continued to whine and protest. He followed after Kutta. Mhumhi pulled Tareq, sleeping and stumbling, through the red-lit door at the end of the dark room. “Watch his head!” said Kutta, and Mhumhi glanced up and cringed at the sight of those dangling hooks above them. The top of Tareq’s head just brushed one, making it swing slowly. The space was now a narrow concrete corridor, hemming them in all around, so that they were forced to go single-file. Mhumhi let go of Tareq and let the boy squeeze behind him so that Kutta could lick his hands encouragingly. He was glad for Tareq’s hulker nose. The concrete space, though clean- those sharp hooks were especially clean, shining in the dim light- though clean, it smelled strongly of aged blood. It permeated the space, as did Mini’s whimpers. There was a grinding sound behind them, and Mhumhi jumped and tried to look back, a difficult task in the narrow space blocked by the bodies of his companions. “The door’s closing,” said Kutta. Indeed, the light was growing even dimmer. Mhumhi felt his heart hammering faster. There were small lights strung up against the ceiling, giving them just enough light to see by. Mhumhi felt the chill of the place sinking into his bones. It was like being back in the sewers again. He stepped forward again. Blood and hulker were all he could smell, and he tried to breathe shallowly, through his mouth. He led the little group through the concrete tunnel for a long time. Eventually Mini quit whining. Mhumhi, unable to look back, entertained a horrible thought that she had given up and died, but of course he could not think like that anymore. And he had a feeling that Vimbo would have made a commotion if she had. He was just beginning to wonder if it would be like this the whole way back to the city- an entire day of traveling in the narrow, freezing, blood-smelling corridor- when the concrete opened up around him and into a broad thoroughfare. It was not empty, either. No- lounging around the area were a vast group of screamers. There had to be at least forty or fifty of them. And they were all turning their heads towards Mhumhi, standing at the exit to the tunnel. “Why’d you stop?” asked Kutta from behind him. Tareq was squirming, as if she were nudging him. One of the screamers gave a soft hoot. They were all looking at them now, some rising to their feet. “Is it Dot?” whispered Kutta, who had at least grasped something of what was going on. Tareq wasn’t backing up, leaving Mhumhi feeling painfully exposed. “It’s not Dot,” hissed Mhumhi. From somewhere in the crowd, one of the screamers let out a shrill bark. Another joined in, and suddenly twenty or so of them added their voices in with ear-shattering screams. Mhumhi cringed, flattening his ears. Suddenly something grabbed him by the scruff and dragged him forward. A group of screamers had been lurking around the side of the tunnel exit. “Let go!” he barked, thrashing, and the screamer dropped him, howling its displeasure. Another grabbed him around the middle, and he pushed it away with his paws. Tareq was wailing too, having been snatched up in Mhumhi’s absence by an ardent male. He was pounding its chest with his hands. Kutta sprang forward, snarling, and lept to fasten her teeth around the male’s wrist. There was a flurry of howling and grabbing after that. Mhumhi struggled his way though, snapping at the eager hands grabbing at him, back towards Kutta and Tareq. The male had dropped Tareq and run away, shielding his wounded hand, but others were moving closer. There was a loud whoop, and Vimbo ran out of the tunnel. Mini was not in his jaws. The screamers seemed as a group unsure of what to do with the hyena, turning their wide blackened eyes towards him. Vimbo charged at the mass of them, lowering his head to give another loud whoop that echoed in the enclosed space. They scattered before him. Mhumhi saw many grasp hands with their companions in their fright, embracing and cringing. Vimbo trotted in a broad arc, clearing the space, and then went over to where Mhumhi, Kutta, and Tareq were. His short tail was curled over his back. “Thanks,” said Kutta, wagging her tail at him, licking her lips, where there was still a bit of blood. Vimbo put his head down and grunted. “Someone come pick me up,” said a feeble voice from within the concrete tunnel. Mini’s displeased whine floated over to them, but Mhumhi was inclined to leave her where she was for the moment as well. With the screamers more or less cleared away from them, he was able to get a better grasp of the new area that they had entered. It seemed to be still a concrete tunnel- but a much larger one, with an echoing concrete ceiling. The track with the hanging metal hooks continued along above them, along a narrow catwalk that looked, to Mhumhi, flimsy and not as well-constructed as everything else in the area. There was a metal track at their feet, as well- long and straight, pointing away from them. It looked like the track that had carried the trolley back in Oldtown. Vimbo trotted away from them and leapt up onto a wooden bench that Mhumhi had not noticed before. Next to the bench was a glass kiosk with a closed door. “To protect delicate sensibilities,” said Mini, panting, a little heap of fur with a pink tongue. “What does that mean?” asked Kutta, but Mini merely closed her eyes. Mhumhi looked back at the mass of screamers, still hovering and hooting back at the other end of the station. Behind them he could see that the tunnel narrowed again, but not nearly as much as it had before- more a dark concrete archway. There were swaying screamers packed within, as far as he could make out. There were definitely more than fifty. “I don’t think so,” said Mhumhi, pointing his muzzle. A little ways away from them, at the edge of the clear space that Vimbo had generated, were two very small screamers, clutching at a larger one. One of them looked at them and put its fingers in its mouth. Tareq mirrored the motion, eyes wide, and spoke around his fingers. That last statement had certainly been loaded with irony. Now Mhumhi was beginning to pick out quite a number of little screamers in the crowd, nestled around their parents’ long legs. He could even see some of the carrying little infants with swollen, closed eyes. “They really are,” said Kutta. “What are they eating?” asked Mhumhi. He had been half-jesting, but now he looked at them and wondered. What were they eating, down here? He couldn’t imagine that the building they had just exited had enough food to nourish such a horde. “Maybe each other,” said Kutta. “Mini,” said Mhumhi, admonishingly. Mini gave a little sneeze. Kutta gave a little snort and went with Mhumhi over to the kiosk. Vimbo made as if he were going to follow them for a moment, then hesitated and walked back to the tunnel exit beside Mini. The door to the kiosk was closed with a simple latch, with a padlock securing it shut- however, it was open. Kutta reared up and twisted and tugged at it until she could pull it free. The door swung open for them. Mhumhi wrinkled his nose. A foul stench had assaulted them the moment the door opened. “Smells rotten,” said Kutta, coughing. Mhumhi felt bile rising in his throat. Inside the kiosk was a low bench, covered in buttons and levers. There was also a chair, and below the bench, a hulker. “A dead hulker,” he said, for Kutta’s benefit. She cringed. The hulker was curled up with its knees to its chest. Mhumhi thought it looked like it might have been male, but it was hard to tell. It was half-rotten, especially the bottom half, which had gotten dark and slimy against the floor. “What’s that smell?” Mini yapped, from far away. Kutta fell silent in the face of this unpleasant revelation. “I suppose it really doesn’t matter how it died,” she said, after a moment. “That’s a terrible idea,” said Mhumhi, but without conviction. He stepped back as Kutta reared up to put her paws on the panel. “I’ll bet it’s this big lever here,” she said, pawing at the panel. There was indeed a very large lever there, nearly central. Kutta put her mouth around the end. 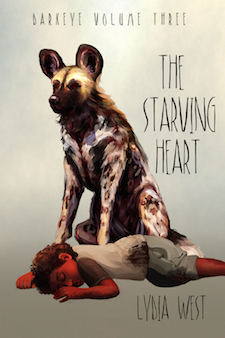 “Wait,” said Mhumhi, and Kutta hesitated, turning one ear towards him. Kutta made a garble of consent and yanked the lever downwards.